Now how could I possibly forget seeing this craziness as a kid? Now, I am almost ashamed to admit I listened to it for the first time. And I loved every second of it. All of its goofy rock opera space craziness, its drony guitar mayhem, and the totally infectious sound. Everything started to fit into place – give a listen and think of the other bands I’ve name-checked here. 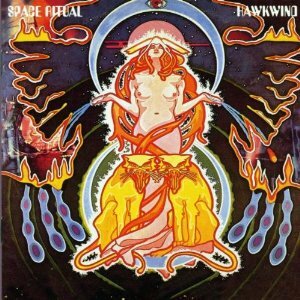 So it will be a week of Hawkwind, to see how far it all goes. Apparently things changed quite a bit with them over the years as they trudged on into the 2000’s. But for now, I’m feeling the same magic as I did when I first worked my way through the entire 13th Floor Elevators catalog recently. How could I have missed all of this? In some ways it’s a similar feeling to what I was thinking as I went through the Renaissance Faire this past weekend with my family. The time is 1574 is Bristol, England, not 2011 in Bristol, Wisconsin. Food is cooked over open fires, entertainment is from acrobats who know how to be both bawdy and family-friendly, and everyone is wearing outfits that can’t be comfortable yet can’t help but to express personality and character. As I walked through the recreation of a village, complete with pubs, vendors, and revelry, I caught myself thinking more than once about Shakespeare, and wondering how in the world he (or whoever wrote those majestic plays) managed to marry high and low so seamlessly. Groundling and nobility alike found truth in those words, and spending an afternoon in that universe helped make it all seem just actually possible. Lastly, speaking of filling in gaps and building bridges, there’s a lot of buzz, rightfully so, around Tinawiren. But are you yet hip to Bombino? Check out this amazing linking of Hendrix to the desert – how can you not be left wanting to hear more? Maybe they need a funky fantasy graphic novel album cover.